One person said Sherburne was dismissed for failing to produce in a timely fashion documents under subpoena by the state Attorney General's office related to its investigation into Sherburne's boss, athletic director Tim Curley. Curley is on administrative leave after being charged with lying to a grand jury and failing to report an abuse allegation against retired assistant coach Jerry Sandusky. The documents were eventually produced voluntarily and without further court intervention, however information is scarce and it is unclear if Sherburne produced the documents or someone else in the department eventually complied with subpoena. 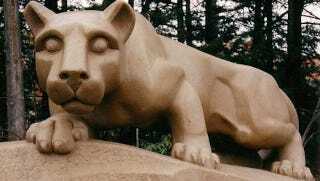 Just about every high ranking official and his or her cousin declined to comment on the story—deferring to some other department —making this just another Penn State story.